Since it's the middle of the week, I will leave this giveaway open until Sunday, November 11 at midnight and announce the winner on Monday, November 12. Thanks for the chance at your great giveaway! I'm a follower. I love scraps and Christmas inspiration! Thanks for a great giveaway! Hi Renee, Wow you are just so very generous-what a wonderful give away! I am a follower(and love your blog)so please count me in-I can always use new inspiration. Wow Renee, what a very generous giveaway!! Love Tilda and your scraps look like fun! Thanks! Look at all those gorgeous scraps! And the pretty little heart. You are so nice to share them. I love your blog and have followed you from my blog sidebar..but now I'm an official follower. That looks like a bunch of pretty fabric! Love the quote "rest in The Lord and wait patiently on Him"! Amazing giveaway... I love scraps especially someone else's ;-) Thanks for the chance! 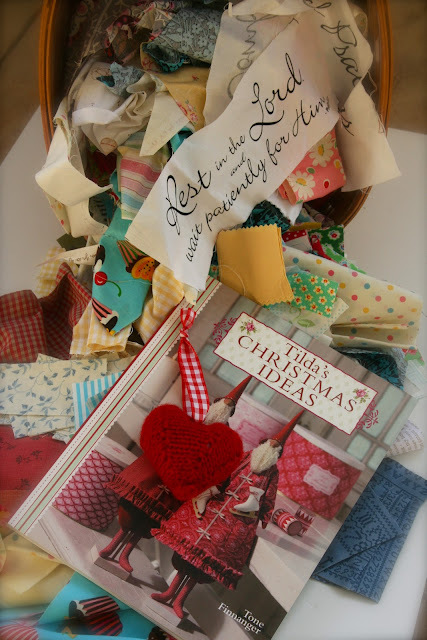 I am a faithful follower...Love books with ideas for Christmas and who doesnt love fabric? Thanks for an inspiring give-away. I am a follower, a scrap basket! All I could think was scrap quilts, I've seen the type of material you use, so I know you have treasures in there! Que MARAVILHA!!!! !Trabalho 90% com sucatas e sou viciada em hexágonos e todo que tem papel,este presente poderia vir para minha casa....Obrigada. Oooh how fun! I'm a happy follower too. :-) Thanks for the chance! I have been a faithful follower for a long time. I would love the Christmas Book and your scraps. The words on the fabric strip in your picture are so very true. Thank you for your generosity! Lovely giveaway! I am a follower. Ooooohhh - scraps!!! My favorite thing in the world (yep - I am pretty low-maintenance - ha ha!). Thanks for the wonderful giveaway. I am a happy follower of your blog. These are great they would make a great crazy quilt block! I'd love to win. WOW what a fantastic giveway for any one of your followers to win. That could be me. You never know. You, my dear, are a very generous person. What a nice scrap quilt to be making a loved one for Christmas. What a fabulous November giveaway! Scraps are SO fun, and some lucky person will have a better start to Christmas gift making! What a lovely giveaway. I always enjoy reading your blog. Thanks for the chance. I'm a follower and long-time lurker--love your quilt projects!! Thank you for the generous giveaway. I already like that part of the fabric you show on the picture, hope that I will win. I love your blog. Hope the move goes smoothly. Hi, Renee. Thanks for all the giveaways you have done this year. And now another chance to be the lucky winner. Here's hoping...Also, I admire the way you have been keeping up with Lori's Row-A-Long. I got somewhat behind when we left for a trip. Your diligence has inspired me to keep trying! A sweet November giveaway!! I am a happy follower! Have a lovely week! xo Heather! I love scraps and this book looks really cute. Thanks for the great giveaway. I am a follower. This follower is very grateful for this and other giveaways you've had. Bless you for your generosity. I am a follower and would love to be entered in the contest. Thanks and have a wonderful day! Thanks for the chance to win! I love Christmas books! Fun scraps and I love Tilda!! Have been a follower since my cousin first told me about your site just 3 weeks ago. I love, love,love it. Thank you for the inspiration and words of wisdom and also the oppotunity to win such a lovely gift. Another lovely giveaway! I love scraps and Christmas! I DO LOVE YOUR SITE. I ALSO LIKE THE SCRAPS! OH RENEE! This is the Sweetest Giveaway ever! Happy to follow you via gfc+blog lovin'! Thanks so for a winning chance! I have enjoyed following your give aways this year, and you have certainly moved out some of your stash! Thank you for your give aways. Thank you for your generous giveaways each month! I love sewing with fabric scraps from other quilters. It's fun to see all the different fabrics. Have a great weekend! Thank you for the chance to win the lovely scraps and the books!! I love your blog! Thanks for the lovely giveaways. How fun it would be to play with new scraps! Thanks for the giveaway and the chance to win. Hi Renee! I just found your blog and it is wonderful! I feel so lucky that I'm in time to enter your giveaway, and I'm just sorry I missed the earlier ones. Thanks from a new follower! Love your blog and would have followed even without the giveaway! Do count me in though. I am a follower. I have just borrowed this book from the library for the fourth time this year. What a great giveaway, thanks for the chance. 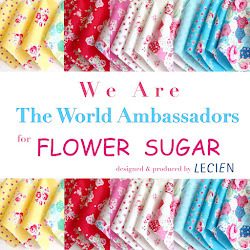 I'm a follower of Sewn With Grace. Your Lori Holt QAL looks so colorful and you did a good job with those flying geese. I struggle with the smaller ones, so am impressed at how straight you have them when sewn together in that long row. Thanks for the lovely giveaway this month, including part of you with the handmade heart. I enjoy your posts. Please enter me in the drawing! Love that you boldly share your faith through your blog ... Thankyou for the opportunity for a chance at your giveaway... I am a follower..